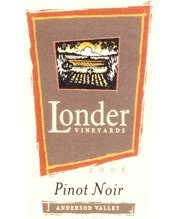 I remember tasting a Londer Pinot Noir several years ago and really enjoying it, although I'm not sure if it was the Estate Pinot or not. Anyways, I'm excited to taste this wine because it's been a little while since I've tasted anything from the Anderson Valley. Anderson Valley produces some really powerful wines and I find it most similar to the Russian River style (meaning relatively full bodied.....for Pinot Noir). This wine is a small 490 case production and was aged in French oak (30% new). On the nose I get beautiful floral aromas mixed with generous cherry and wild berry notes. There is secondary aromas of roasted meat, leather, and spice. A very classic cool weather, hearty, and rich style bouquet. I'm seeing a pattern surface here...on a bit of a pinot kick? Yeah, I've been going through a bit of a fascination with the grape, but I'm sure it will change with the weather! Usually I really dig Cabs and bigger reds during this time of year but for some reason Pinot is doing it for me right now. I may be in need of a Napa trip pretty soon! Nothing wrong with hitting the pinot. I love to drink it all the time for sure! I myself am jonesing for another trip to OR & WA. Thanks sook! Lovely to hear from you!